Four-wire nonmetallic-sheathed cable is also available with two ungrounded (“hot”) and two neutral conductors. This cable is designed for wiring two 120-volt branch circuits without using a common neutral. derating [required by NEC 310.15(B)(3)] is started in the 90°C column of NEC Table 310.15(B) (16). Table 5-1 illustrates application of derating for the number of current-carrying conductors in the home run cable. 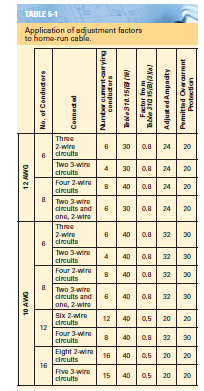 Notice that the number of currentcarrying conductors can change depending on how connections are made. Anyone have preferred residential wiring contractors they use or have heard of? One of the guys I refer to regularly.